By communicating with third-party systems and equipment throughout the shop, Avanti Slingshot eliminates costly, time-consuming manual steps. Reduce errors, increase cost transparency and save time – these are all key benefits to using JDF. 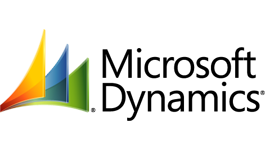 Avanti is a leader in Job Definition Format (JDF) certified, cloud-based Print MIS. Crafted so that seamless integration between your Print MIS software, prepress, production, and bindery is possible, Avanti Slingshot enables your equipment and software to ‘talk’ to each other. Download Avanti’s Advanced JDF Framework datasheet. For several years now, Avanti has been a member of CIP4, a consortium of vendors, consultants and end-users in the print communications and Graphic Arts industry, covering a variety of equipment, software, peripherals, and processes. Avanti participates in focus groups to help define future versions of JDF, to study user requirements, and to design the JDF Software Development Kit (SDK). 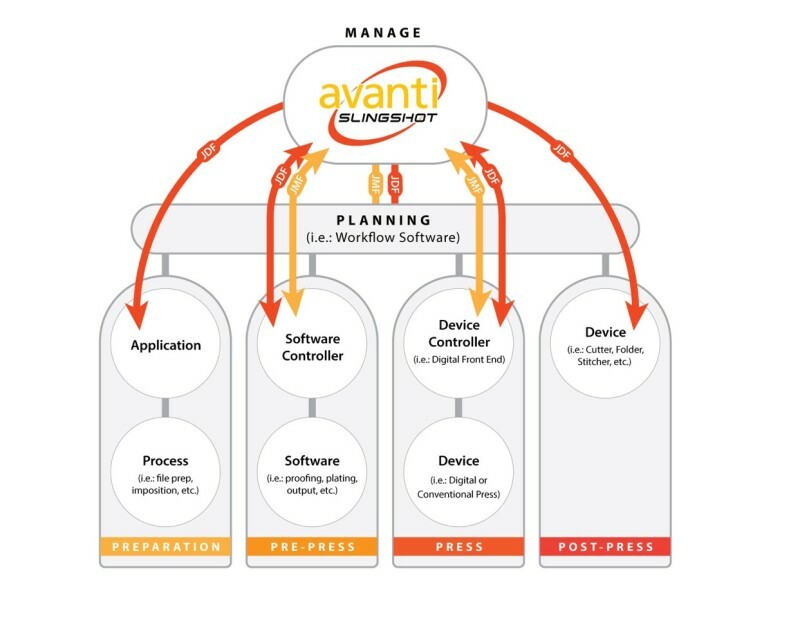 Avanti’s JDF framework, winner of a 2014 Must See’em, helps our customers move away from “one-off” JDF customization projects to an environment where new equipment and new software can communicate via JDF in a very cost effective way. Avanti Slingshot was awarded JDF certification for both MIS to Prepress and Integrated Digital Printing. The list of Avanti supported prepress software and production equipment for both the press shop and the bindery is growing every day. Avanti Slingshot’s Advanced JDF Framework ensures that JDF is no longer the exclusive domain of large corporations by doing “the heavy lifting” to make that handshake a much less costly and time consuming project. It creates a seamless information and data-transfer link between your MIS software, prepress, production and bindery equipment. In short, it provides an environment where all the software and equipment in your shop can speak the same language. It gives any shop the ability to connect their “islands of automation” and send automated job instructions to a machine using JDF, and the machine can then send production information back to Avanti using JDF and/or the Job Messaging Format (JMF) in order to update job status, collect costs, and adjust inventory…all in real time. When a job created in Avanti Slingshot is released to production, the JDF module will send as much information as the system receiving the job can understand. With Avanti Slingshot’s JDF Framework, new integrations are now able to be achieved within days, not months. And with lower integration costs, your ROI improves. Exporting information from your main system to a sub-system can sometimes result in hours of work ensuring data remains accurate and nothing is missed. Avanti’s Accounting module provides integrations and file transfers to a variety of accounting packages, giving you the choice of who you want to work with. Because of the differences between packages, each integration is different. However the results are the same: reduction of manual, and often costly, data entry time and errors. A/P invoices are reconciled in Avanti Slingshot through a three-way matching process after which, when the payable has been approved, the information is exported to Dynamics GP. All customer invoicing takes place in Avanti Slingshot. Once the invoice has been approved, basic information is exported to your accounting system. Eliminate the islands of automation throughout your shop with Avanti Slingshot. It sits in the center of your shop, sending and receiving information from all of the key applications and equipment that you count on to run your operation. Using JDF integration, Avanti has enabled seamless integration between Avanti Slingshot and your Bindery equipment. Quick to setup and easy to use, it saves you money and time while reducing room for error. Manually collecting machine data takes time and results can be questionable due to human error. Avanti’s Direct Machine Interface (DMI) has the ability to simply capture the data automatically through a link to the machine’s controls. Avanti Slingshot’s award-winning Advanced JDF framework creates a seamless link between the MIS and the third-party pre-press. Information has the ability to flow both directions, relaying information such as job parameters and production data. Both quick to setup and easy to use, it has the ability to increase a company’s ROI through time and money saved. The key to increased productivity is automation. Automation enables you to reduce turnaround time and room for errors. Avanti Slingshot minimizes Web-to-Print complications with a Third-Party Web-to-Print Integration (API). Avanti Slingshot becomes the hub of the wheel, collecting all order information no matter where or how that order is placed. Tight integration with several third-party solutions, enables automatic data transferal between Avanti Slingshot and your order entry system (i.e. Web-to-Print) through XML or JDF file formats. Re-keying information is no longer needed.